Like the Sovereign, these were circulation coins until 1933. These coins, with Willem 111 are known as the Dutch Kings and are considered rarer than the Queen Wilhelmina coins. The Dutch Guilder is one of Europe’s most-sough after historical coins and has a history that dates all the way back to 1600’s. In 2002 it was replaced by the Euro. As with many coins of antiquity, they are particularly popular with collectors, for whom owning a piece of history is a great lure. This in turn makes them a highly reliable investment opportunity as there will always be a market for historical items such as these. Classified as 21.6 carats, which amounts to over 90% fine gold, for historical coins they are of particular purity when compared to most. That means it has a gold content of 0.1947oz and a minimum gross weight of 6.729g. 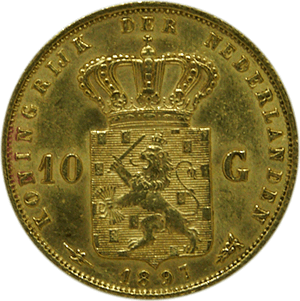 The 10 Dutch Guilder coin itself was manufactured until the 1930’s and typically have either King Willem III or Queen Wilhelmina on the back. King Willem III versions are rarer and therefore more valuable than their Queen Wilhelmina counterpart, but this may depend on the condition of the coin itself. Along with the British Sovereign, the Dutch Guilder is arguably the most popular choice of historical gold coin for collectors. This is partly down to its ability to retain its value, making it not only reliable for investors, but profitable. Another level of reliability is down to the fact that the Guilder, along with most gold coins of their specific region, were produced and verified by the Dutch State, meaning the chances of inaccuracies are very small. It is still vital, however, to ensure that any gold product is bought from a reliable source. Goldinvestments.co.uk are one of the most experienced vendors in the UK and the wider world. Unlike many online traders, we have a physical office from which we provide a highly-respected customer service.